Beginning March 26, 2018 the PMP Exam will be based on the PMBOK 6th Edition. Free Practice Exams for your smart phone. 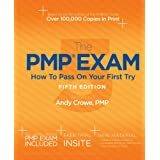 Karen's Recommended Study Guide is Andy Crowe's PMP Exam How to Pass on Your First Try. You get 1 month's free access to the online practice quesions test bank.